This is a vintage woodworking plan. Visit our FAQ page for a full definition. 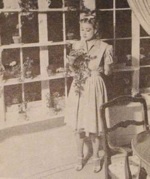 Shown here is the attractive window garden from the Hollywood home of Ann Southern. These plant shelves solve the window garden problem. They are built into a unit which may be set up without injuring the window woodwork. Condition of this recycled plan: Good (priced as marked), we have one copy of this plan available. Plan is printed on one sheet of 17 x 22 inch paper.